Today Cloud computing is widely deployed by large global and small local organizations alike, whereby hundreds or thousands of users, devices and printers, often across locations and geographical divides are connected with the data center over the Cloud. Mobile users may need to print from multiple locations – in different parts of a building, in a branch office or from another country, using corporate or their own devices. To enable fast and reliable cloud based printing in such complex environments, IT has to overcome many issues. They include new printer and driver installations, printer management and driver updates, printer mapping, and securing sensitive data as the print data stream makes its journey from the user device to printer across the Cloud. UniPrint Infinity provides a cloud printing solution that simplifies intra-organizational printing structures to align the printers, drivers, devices and users within the system. The software comes with user-authenticated pull printing that improves document security; and a high availability with load balancing capabilities setup that allows full redundancy to maximize printing uptime, all of which are key to driving your enterprise Cloud success. The user starts a VDI session by connecting to an application server in Azure. From an application, the user prints a document. The UniPrint universal printer driver (UPD) creates a compressed PDF file and transfers it to the UniPrint Bridge. 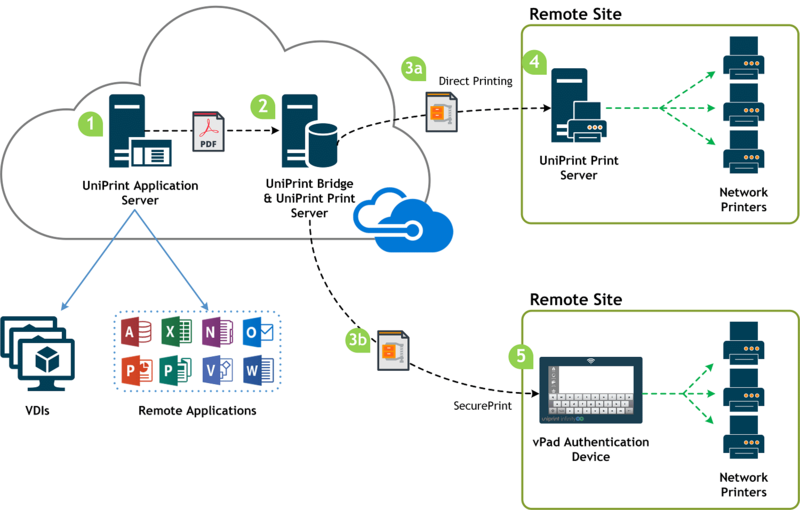 The UniPrint Bridge and Print Server, renders the PDF print job into compressed print data and then streams the print data to the appropriate remote location. Compressed print data is sent to either an onsite UniPrint Print Server or to a vPad device. For direct printing, the RAW print data is sent to an on premise UniPrint Print Server. For SecurePrint, the user is required to authenticate at the vPad first. The UniPrint Print Server decompresses the print stream and forwards the RAW print data to a network printer. After a user authenticates, the vPad device decompresses the print stream and the RAW print data is sent to a network printer for printing. Through UniPrint Print Server, UniPrint Infinity eliminates the need to install client software on user devices enabling clientless or zero client printing. UniPrint’s all-client capability promotes reliable and fast printing no matter where you are working across the Cloud. Users are able to enjoy efficient cloud printing through their mobile devices, with the ability to print seamlessly over RDP, PCoIP, Extreme Blast or ICA. UniPrint Infinity supports any printer make or model. Print commands sent through UniPrint Virtual Print Queue (VPQ) to busy or non-functioning printers can be redirected to other available printers for immediate printing, minimizing unnecessary work disruption caused by a printer breakdown. UniPrint Infinity offers full redundancy through the High Availability (HA) setup, providing an effortless alternative to Microsoft Cluster Services. The result: All users connecting to any platform can print from any client device to any printer at any time in any location across geographies. Microsoft Azure is a growing collection of integrated cloud services that used to build, deploy, and manage applications. With UniPrint Infinity and Azure, you get the freedom to build and deploy cloud printing wherever you want, using the tools, applications, and frameworks of your choice. No more “driver mess” or print queue errors! At the core of UniPrint Infinity is our patented, PDF-based Universal Printer Driver (UPD). UniPrint UPD replaces all manufacturer printer drivers on the application server, negating the need to manage multiple printer drivers in any computing environment, be it Citrix, Microsoft RDS, VMware View-based. In addition, with the UniPrint PrintPAL printer mapping utility, administrators can set up remote print servers without site-to-site VPNs. With printer incompatibility issues out of the way and simpler printer setup and deployment, printer management is almost effortless. UniPrint Infinity is PDF based. By deploying UniPrint Print Servers in remote locations, print spool files will be converted and compressed by over 90%, providing speedier printing with the added benefit of less network bandwidth usage. UniPrint Infinity is a true UPD that supports any printer make or model. This gives organizations more flexibility when it comes to choosing new printers or accommodating existing printers in a cloud computing environment. Rather than dictating what printers your end users must standardize to print, UniPrint allows your clients (end users) to choose printers based on their specific business requirements, pick the “best-of-breed” hardware from any vendor, and enjoy the best end user experience in printing.